This is a potted history of UK government initiatives over the past few decades to find ways for citizens and businesses to prove who they are when using online public services. 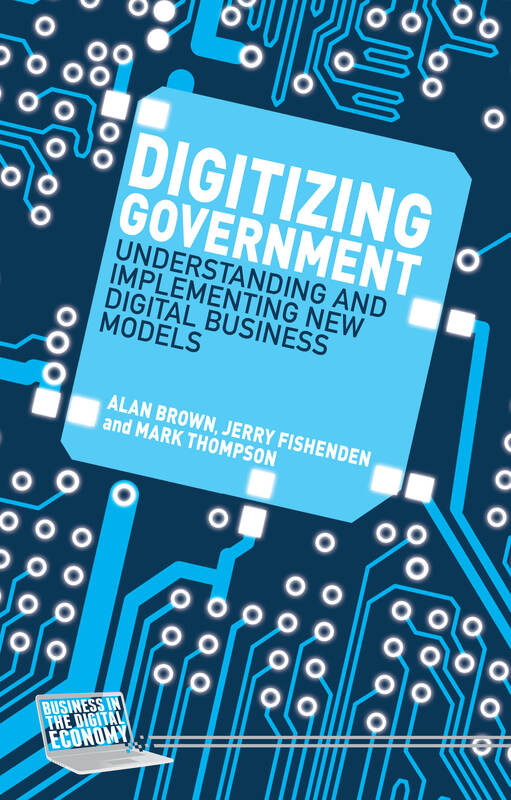 The developments discussed here draw upon my Digital Government and e-Government Archives, together with some other public domain sources. Given the archives are now growing quite large, the aim is to help provide additional context on the specific topic of identity. This isn’t a comprehensive narrative of UK government online identity, but intended to provide a flavour of the key developments and policies over the past 20 or so years. It’ll be updated and improved from time to time. Online public services often need to have proof of someone’s identity. Personal tax and welfare information for example, or medical records, require assurance that the person trying to access that information is really the person they claim to be – and that they have the right to access those records. The 1998 Parliamentary Office of Science and Technology (POST) report “Electronic Government: Information Technologies and the Citizen” in February 1998 set out two opposing views of identity (illustrated below) which have essentially defined the issue of identity in the UK: an official government-backed identity card versus cultivating a marketplace of identity providers. The UK has experimented since at least 1997 with the use of third parties to help prove identity. These various attempts to use third party identity providers (IDPs) from 1997 onwards are discussed in more detail in the Key identity policies and initiatives below. Another approach to identity was developed during the period 2006-2010, when identity cards were proposed as a so-called “gold standard” to tackle the issue of identity. This was not the first time identity cards appeared – they were introduced in 1939 for the second world war via the National Registration Act, which established both a central register and the cards themselves. The National Registration Act of 1939 was repealed on 22 May 1952, after which it was no longer necessary to have an identity card. The Identity Cards Act of 2006 saw their reintroduction. However, the out-dated design of the approach (mandating plastic cards in primary legislation, together with a central register continuing a rich mix of biographic and biometric data) generated notable criticism from security experts, lawyers, civil rights activists, IT and computer professionals and politicians. Part of the idea of the central register was that it would hold an extensive set of personal biographical data, and various biometrics (such as fingerprints, digitised facial scan and iris scans). It would also map an individual to the various unique index numbers used in other parts of government – such as a citizen’s National Insurance Number (NINO) – to enable these disparate systems to be interconnected and linked to a “unique identity”. Whilst this was seen as a convenience for promoters of the approach, for others it represented a significant security flaw and breach of citizens’ privacy. The incoming coalition government in 2010 repealed the Identity Cards Act via the Identity Documents Act. The focus once again swung towards the alternative model, with work starting in 2011 on an identity assurance programme initially called IDAP (it was later renamed “Verify”). However, some elements of the approach taken with identity cards have remained, most notably the biometric residence permit (BRP) which provides evidence of the right to reside for non-UK nationals. UK driving licences and passports are the main official documents used to help prove identity, despite this not being the purpose of either of these documents. For those UK citizens without either a passport or driving licence, proving identity can be difficult. Some 20 years after the initial use of third party identity providers, a variety of initiatives are currently in play. The majority of central government online services currently use the Government Gateway, which has been in operation since 2001. It provides an open standards-based means of accessing services such as HMRC’s Self Assessment online using a UserID and password, more recently also enhanced with two-factor authentication (via a time-based code either texted to a registered user’s phone, or generated by an application running on the user’s mobile phone). At the technical level, the Government Gateway uses the same standards adopted by the more recent Verify programme – being based on SAML (the Security Assertion Markup Language), although it also has support for digital certificates (and W3C digital signatures) and EMV (chip and PIN card) authentication. The digital signature standards were compliant with the EU’s Electronic Signatures Regulations. The Government Gateway identification and authentication services also support the authentication of transactions with government APIs (system interfaces) – such as, for example, the way an accountant can sign and submit a transaction via their accounting software. It is unclear the extent to which Verify currently supports APIs and transactions. The Government Gateway provides a way for citizens, businesses and intermediaries (those acting on behalf of others, such as accountants or those holding Power of Attorney) to authenticate to government services. The recent National Audit Office report on Digital Transformation in Government noted that it “currently hosts 138 live public sector services, and … is being improved“. Since 2011, the government has been pursuing what is now referred to as the Verify identity assurance framework. This aims to establish a set of standards that will enable both private and public sectors to trust an online identity so that citizens can re-use it across multiple service providers. This work is the latest iteration of the use of standards-based frameworks and trusted third parties by UK governments, work that has been developing since the late 1990s. It was able to draw upon the experiences of identity assurance frameworks, standards and systems that had been developed and implemented over the years. The GOV.UK Verify hub being developed in-house by the Government Digital Service was originally intended to replace the ageing Government Gateway with a Verify identity assurance framework-compliant system. After 6 years of development, the NAO reported that “In February 2017, 12 services were using Verify” of which 9 also allow access by other means. It currently has a successful completion rate across all services by citizens of around 38% according to the Verify hub’s performance dashboard (the current success rate can be seen here). The plans set out in the Government Transformation Strategy of 9 February 2017 aim to deliver 25m users of this system by 2020. Unlike the Government Gateway, according to the GOV.UK Verify hub team the Verify central hub will only support citizens and not businesses or agents. It is also unclear how the Verify hub will support the many citizens who need to delegate authority – e.g. to an accountant to do their tax return, or to exercise Power of Attorney on behalf of an ill relative for example. At this stage, there are still some concerns as to whether the target 90% plus of citizens and residents could successfully be verified online. The experience borne out in the UK does nothing to alleviate this, although Jersey could consider a variance to the UK identity proofing and verification standards to place greater emphasis on government data sources and less on financial information. There are various other identity initiatives, including Patient Access within the NHS (for patients to access their medical records), and a multitude of approaches by local authorities and others across both public and private sectors. STORK: (Secure idenTity acrOss boRders linKed) which was a pilot scheme announced in 2008 and co-funded by the EU aiming to implement EU-wide interoperability of electronic identities (eIDs). The pilot work tested several existing national eID applications, including the UK Government Gateway and Belgium’s LIMOSA portal. The GOV.UK Verify team, in a blog from 2014, announced that they too would be working to develop interoperability with STORK. eIDAS: (electronic IDentification, Authentication and trust Services), an EU regulation setting out standards for electronic identification and trust services for electronic transactions in the European Single Market. Despite Brexit, the UK appears to be aiming for compliance with eIDAS in order to remain compatible with the systems of EU member states. Some details of earlier work on eIDAS compliance were provided by the GOV.UK Verify team in a blog post in 2014, with some updates in November 2015 and December 2015. PSD2: (the second Payment Services Directive), a notable evolution of existing regulation established for the payments industry to update the original 2007 Payment Services Directive. Most of its provisions take force from January 2018. It includes stronger requires around customer authentication, protection and security. It is an important component of the work to develop a Single Digital Market in the EU. 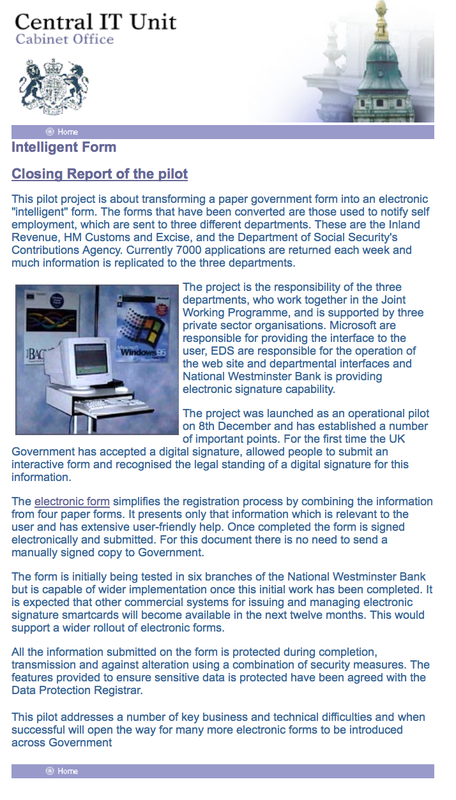 1997 saw the UK Government attempt to streamline and improve the online experience of government services with the Intelligent forms project (“iForms”). iForms enabled a user to fill in one single online form and sign it digitally with their smartcard. This Smartcard News from December 1997 contains some details about the work. The smart online form – the iForm – removed duplication and unnecessary bureaucracy from the paper process. For example, the user only needed to enter their personal details once rather than three times. In the case of the initial iForms project, the programme took numerous paper forms related to registering for self employment and re-designed them as a single smart (“intelligent”) online form, significantly reducing the amount of repetitive data previously required from the user. Appropriate data from the form was then parsed and sent to the three relevant departments – Inland Revenue, HM Customs and Excise (both now merged into HMRC), and the Department of Social Security’s Contributions Agency (now part of DWP). This 1997 work is an early example – possibly the first? – of the UK government using a third party identity provider, namely NatWest bank, for citizen identification and access to online public services. Smart cards can be used for applications such as electronic purses and credit and debit cards, for ID and access control, to hold official documents, for data storage, in mobile phones, and to digitally sign documents to prove integrity and authenticity. In May 2000, the tScheme initiative was formally incorporated as an independent limited company. tScheme has been an important element of the idea of using trusted third parties to undertake identity assurance. Its members have worked to develop and implement a trusted scheme for industry self-regulation and its work has underpinned both the 2001 Government Gateway initiative as well as more recent work on Verify. Progress towards higher level services for government electronic service delivery will crucially depend on the development of appropriate electronic authentication and security processes for use by businesses and citizens. identify where the marketplace is adopting suitable technologies for secure transactions and access, and ensure that the Government makes full use of these to meet electronic service delivery targets. the authentication of citizens and businesses seeking to access government services electronically. 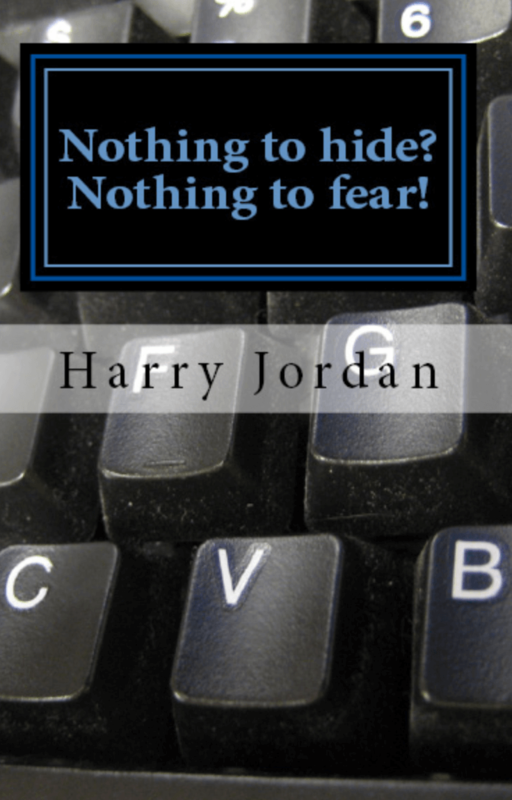 It applies in circumstances where government needs to have trust in the identity of those it is dealing with to ensure that there is no breach of privacy or confidentiality, or other harm. The Framework provides for those cases where anonymous or psuedonymous access is also acceptable. For most electronic transactions, government will accept authentication provided by accredited third parties, which will register individuals and organisations and issue them with credentials enabling them to authenticate themselves in subsequent transactions. … in a compressed timescale, using rapid deployment methods to build a fully functional system in 3 months. … offer citizens and businesses a single authentication service for all government transactions, such as sending in tax forms. Once a user has successfully registered, they will be able to access services from different Departments using a common user ID or digital certificate. The Modernising Government white paper makes clear government’s intention to work in partnership with local authorities, the voluntary sector, and with third-party delivery channels such as the Post Office and private sector companies. Where third-party service providers are conducting transactions on government’s behalf, they will be required to authenticate the citizens and businesses they deal with to the same standards as government itself would. Government will in turn accept transaction data from those service providers, who will certify that they have carried out the authentication transaction to the agreed standard. is concerned with the registration and authentication of citizens and organisations seeking to access government services electronically. It applies in circumstances where government needs to have trust in the identity (real-world or otherwise) and authority of those it is dealing with to ensure that there is no breach of privacy or confidentiality, theft/misuse of data, or other harm. The framework includes those cases where anonymous or pseudonymous access is acceptable. It again emphasises that the government approach is to be through the use of third parties, including obligations on third parties for registration and authentication and their associated trust models, with more detail provided in the companion Registration and Authentication paper. Service delivery in an inclusive and integrated manner is an essential commitment of this programme. Reaping the benefits of a joined-up channel strategy requires organisations to move to a model where services are built around customer needs and not organisational structures. Several pieces of updated guidance were published in January, including the second versions of HMG’s Minimum Requirements for the Verification of the Identity of Individuals, and HMG’s Minimum Requirements for the Verification of the Identity of Organisations. … create a mixed economy – a marketplace where government, private and voluntary sectors can come together to deliver e-Government services that better meet the demands of our customers. a mixed economy in the supply of public services, where consumers (citizens & businesses) can engage intermediaries from the public, private or voluntary sectors to use public services in the manner that suits them. The Liberty Alliance – described as “a global organisation for organisations and companies interested in improving online accessibility and security through the development of open standards and related guidance” – recognised the Government Gateway with the annual Liberty Alliance Awards in October. (The Liberty Alliance was succeeded by the Kantara Initiative in 2009). sign up for many of the online UK Government services using a single user-identity and password. It also enables online services that are secure and allow people to use the internet for things like filing tax returns and applying for benefits. There are now well over 9 million registered users on the Government Gateway. 2006 is also notable for the appearance of a very different approach to identity: the Identity Cards Act, which received Royal Assent on 30 March. The Act specified the creation of UK national identity cards (to serve as a personal identification document and European Union travel document) linked to a database known as the National Identity Register (NIR). The introduction of the cards and NIR represent the alternative model originally identified by POST, with government assuming control over identity – a very different approach to the efforts since 1997 to use trusted third parties as part of the identification process. At a public event in April of 2007, the Cabinet Office’s e-Delivery Team and others provided a series of presentations on the state of play. This included a presentation on The Government Gateway. UK Best Practice on Infrastructure and Identity Management. those countries with the most effective ID assurance systems and infrastructure will enjoy economic and social advantage, and those without will miss an opportunity. There is a clear virtuous circle. The ease and confidence with which individuals can assert their identity improves economic efficiency and social cohesion, which in turn leads to a greater number of transactions being reliant on such ID systems, further enhancing delivery of economic and social goals. A consumer-led universal scheme would better deliver on national security goals than any scheme with its origins in security and data sharing. be seen to offer superior levels of assurance. In parallel with these various developments , the Government Gateway continued to be iteratively enhanced. The Employee Authentication Services (EAS) (Powerpoint format) was described in May 2008 as a common trust framework able to work across central and local government. And the UK Government Gateway Remote Authentication approach in October 2008 included chip and PIN authentication for the Ministry of Defence. The latter illustrated the ability of the Government Gateway to enable third party authentication using industry standard EMV chip and PIN cards (such as those used by most banks). Today people have to use a variety of documents to prove their identity: passports, driving licences, birth certificates, utility bills, etc. However, none of these are officially identity documents and, furthermore, you will often need to use more than one of these documents to prove that you are who you say you are. Sometimes, using these documents requires you to give away more personal information than is necessary or desirable – details on your bank statement for example. An identity card will offer a useful and more convenient way for an individual to prove their identity in a wide variety of circumstances. Depending on the level of identity assurance required for a particular transaction, an individual’s identity will either be checked visually, through entry of a PIN number or by checking fingerprints via a chip on the card, or for the highest level of assurance, a check against the National Identity Register (NIR). In common with cards in other European countries, the identity card will also allow you to travel within Europe without the need for a passport. Despite work on ID cards and the associated NIR, work also continued in parallel on the long-standing approach to use of third parties, as the Department for Work and Pensions (DWP) presentation on Authentication (Powerpoint format) from September illustrates. The presentation shows the various common cross-government platforms of the Government Gateway – such as the Payments Engine, Secure Mail, Secure Transaction Engine, Transaction Orchestration, Alerts, and Strong Authentication – providing a cross-government enterprise architecture of re-usable systems. It indicates that there were 17m service users and 90 authenticated services at the time, with authentication services being used by citizens, businesses, government employees and EU and foreign nationals. The presentation goes on to illustrate how online authentication services could include support for the National ID Card if required – notably for what it refers to as ‘Gold Identity’. In December, the Technology Strategy Board hosted a meeting at BIS (the Department for Business, Innovation and Skills) on Trust in electronic transactions: an opportunity to change the landscape. The objective of the workshop was to shape the scope of an £8m Technology Strategy Board competition to be launched in early 2010. This year saw the repeal of the Identity Cards Act courtesy of the Identity Documents Act. The Government agreed on 14 March 2011 to the development of a consistent, ​customer-centric approach to digital identity assurance across all public services. This will allow service users to log on safely to digital public services in a way that ensures personal privacy, reduces fraud and facilitates the move to online public services. Our intention is to create a market of accredited identity assurance services delivered by a range of private sector and mutualised suppliers. A key improvement will be that people will be able to use the service of their choice to prove identity when accessing any public service. Identity assurance services will focus on the key imperative to ensure privacy. My Department is leading the project to develop the design and the creation of the market within the private sector. By October 2011 we expect to have the first prototype of the identity assurance model to test with transactional Departments and public sector identity assurance services, with a date for implementation from August 2012. A variety of updated identity assurance documents were published from 2012 onwards, replacing the numerous related documentation that had been published over the years since the original e-government Authentication Framework of 2000. These documents on Identity assurance: delivering trusted transactions updated guidance on topics such as Authentication credentials for online government services and Identity proofing and verification of an individual. Privacy and security are key concerns of the Identity Assurance Programme. The IDAP is developing a model which aims to address these concerns. It is engaging with an independent Privacy and Consumer Advisory Group comprising external stakeholders to work on this issue. It is also working with the Government’s National Technical Authority for Information Assurance to ensure that the model meets security requirements. The page “Introducing GOV.UK Verify” was originally published by the Government Digital Service in June 2015 and provided an overview of and introduction to the Verify programme (formerly known as the Identity Assurance Programme, or IDAP). As with most of GOV.UK, there is no page history meaning it is impossible to track how it has developed over time. However, this here (PDF) is a copy of how it looked at the time according to the Wayback Machine, (or this is a direct link to the Wayback Machine site capture from 2015). You can see the current iteration of the page here. October also saw the first public release of various “Good Practice Guides”, the latest iteration of guidance in areas such as identity proofing and verification of an individual, published by CESG and the Cabinet Office – updating the guidance provided from 2000 onwards in documents such as the e-government Authentication Framework. GOV.UK Verify allows people to use one account to prove their identity online securely for government services. GDS will work with the private sector to enable people to use the same account, which meets high government standards, to prove their identity online for private sector services, such as opening a bank account without having to go into a branch. As noted in the introduction, there remain a variety of approaches to identity assurance across the public and private sectors. The Verify identity assurance programme aims to establish a common trust framework to help improve this situation, but at present there remain multiple platforms, systems and approaches underway both within the public sector and the private sector. It’s important for the future of online services that government helps nurture a robust, trusted, secure and viable approach to identity assurance that can work right across our digital economy. So it’s worth making time right now to do an honest, open and public reset to get this right. Many attempts to tackle online identity fail to understand the wider issue of how to match a proven, trusted identity to specific data or records relating to that person. This is a problem that can often be as complex as proving identity online – which in itself is fraught with challenging issues, particularly the level of assurance that a citizen entering identity-related information is the same as the citizen they claim to be. I discuss some aspects of the data matching or identity matching issue in my May 2017 blog The identity / data divide.